ScreenSteps Desktop 2.9 and Workgroup DocumentationScreenSteps Desktop & WorkgroupScreenSteps 2.9 Exporting to the System ClipboardWhy don't images show up in emails I send that I pasted a lesson into? In Apple Mail you need to make sure your email message is sent using the Rich Text format. 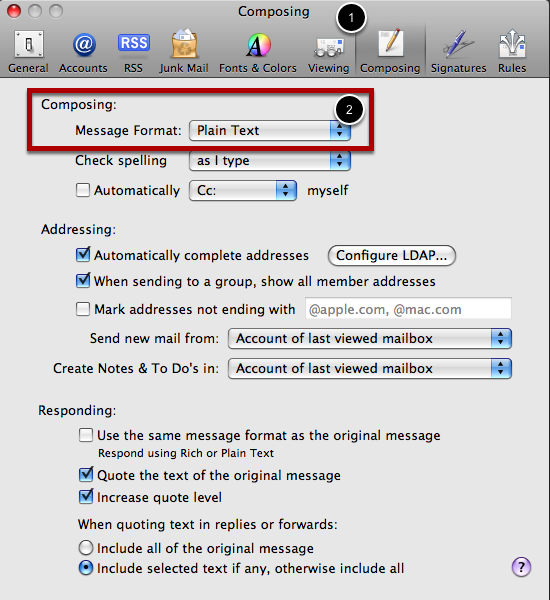 Apple Mail allows you to set a default message format when composing email messages. In the Compose tab of the preferences window (1) you can set the default Message Format to Plain Text or Rich Text (2). This setting will apply to all new email messages you write. 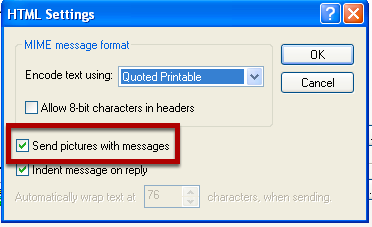 If you normally send email messages as Plain Text then you can change the formatting on a per-message basis. 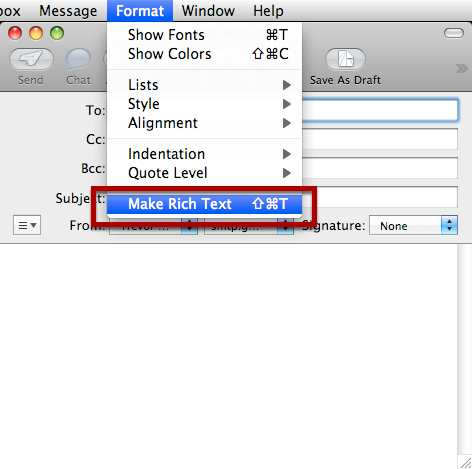 After creating a new message select Make Rich Text from the Format menu. You can now paste the document you exported to the clipboard as rich text into the email. 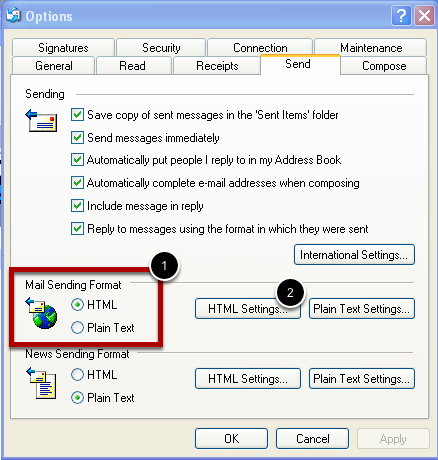 In order to send the document images in email messages you send from Outlook you need to ensure that the Mail Sending Format in Options > Send is set to HTML (1). After checking this setting click on the HTML Settings... button (2). Make sure that Send pictures with messages is checked as well. Prev: How do I paste the path to the PDF file into a file selection dialog on Windows? In our tests we could not get Entourage to accept HTML from the clipboard. We tried copying and pasting from a couple different programs. If you can find a program that you can copy text and images from and then successfully paste into Entourage let us know and we can investigate further. In Gmail, is it possible to sent HTML lessons exported to the clipboard and get the pictures in? Do you have instructions? @Alain Not that I am aware of. Images included with an email composed in Gmail need to be uploaded and that doesn't occur if you just paste the clipboard contents into a message in Gmail. Thanks, Trevor. I have made other tests. Indeed, I can paste the HTML from the clipboard to get it in Gmail. It gets in the email message with blank boxes as placeholders for images. Then I have to upload each image in turn, in its proper place and delete the place holder. It might be long for lessons with lots of images but it gives a pretty good result that can be saved as a template for further emails.